Here’s something you don’t want rank #1 spot in: ladder injuries. Our country leads the world in the most ladder-related deaths. And ER physicians see more than 164,000 ladder injuries every year (World Health Organization). And we’re now in the peak season of these accidents. Trimming the tree with tinsel and topping it with a star or stringing up lights both inside and out all usually require the use of a ladder. If you’re not careful, a catastrophic fall can lead to serious injury, paralysis, or even death. The most frequent ladder injuries our board-certified, orthopedic surgeons in Austin see at this time of year are ankle sprains and fractures, spine injuries, and broken or fractured wrists from breaking a fall. Concussions are also common. Choose the right ladder for the job. Step stools or lower-reaching utility ladders are good for indoor jobs. Extension ladders should generally only be used outside. Set up on a secure surface. Make sure ladder is on a flat, stable surface clear of debris, and if working outdoors, avoid ladder use when it’s raining or wet. Watch out for risks overhead. Stay clear of light fixtures and chandeliers inside when using a ladder, and outside avoid working near power or electrical lines, street lights, or heavy, hanging branches. Practice the one-to-four rule. This means that the base of the ladder should be one foot away from the wall for every four feet that the ladder rises. A ladder that is too close or too far away may not produce enough support and cause instability. Sport proper footwear. Wear closed-toe, sturdy shoes while working on a ladder—and make sure laces are tightly tied. Even though we may still experience some warmer temps here in Central Texas over the next few weeks as you start decorating, try not to wear flimsy flip-flops and sandals. 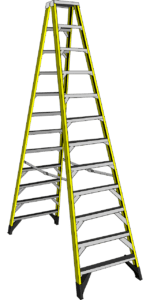 Another important reminder is to always have someone nearby who knows you are on a ladder – either spotting you and holding the base for you right there – or within earshot to call for help if you fall. In the event of a serious accident, seek medical help right away. Our Texas Orthopedics After Hours Clinic is always available with no appointment necessary. Call us for an appointment at (512) 439-1000 or contact us here.